Over the past year and a half of living in Homer I have heard the name "The Eagle Lady" bandied about. I didn't know who she was, what she did, where she lived, or anything else about her. Two weeks ago a friend and I were out skiing and she mentioned the Eagle Lady, and two days later, Jean Keene, the "Eagle Lady", had died. It is only now, having read about her life in the local papers (see http://homertribune.com/ for a wonderful account of her life), that I begin to understand what an impact this lady has had on Homer. This afternoon at a ceremonial eagle feeding in memory of the Eagle Lady I had tears in my eyes and my heart was heavy even though I hadn't known Jean. I don't agree with feeding wild animals, still don't understand why Jean was allowed to when no one else is, and yet I couldn't help but feel the significance of t he moment and I appreciated this gesture--a ceremonial feeding--for people to come and see what Jean did, and in a way, to say good-bye to her. Part of my tears and heavy heart were for my husband's grandma who died this week and whose funeral was just this morning. My thoughts turned to legacies that some people leave behind. Jean did, as the Eagle Lady, just as my husband's grandma did, with her indomitable, fiery Irish Catholic spirit. The papers say that Jean Keene put Homer on the map, that people would come visit Homer just to see the eagles, that she helped the local economy by drawing people here time and again. She also forged relationships, connecting with people all over the globe. I can't shake the feeling that there was something special going on here, as much as I intellectually resist the implications of feeding wild animals. The eagle feeding has attracted hundreds of people to Homer over the years (thousands, perhaps? ), many of them photographers. Today the photographers were lined up, tripods, microphones....all the fancy doo-dads. It was almost as interesting watching them as the birds. You could tell some people were there for the birds, some people were there for Jean, and others just hoping for a good shot with their camera. I took Denver out of curiosity: I wanted to know what all the fuss was about. Was this really as neat as people said it was? 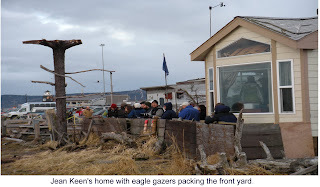 Reports say 300-500 eagles show up for this event, and as 3:00 neared, I looked around and every lampost, every building top, every perch within sight of the Eagle Lady's trailer at the end of the Spit had an eagle or two, or six perched on it. There were, literally, hundreds of eagles perching, swooping, flying, scrawing. Usually people are not allowed to get out of their cars during the feeding, but for this one time they made an exception and allowed everyone up to a cordoned off area of the beach. Ten minutes after they started throwing the frozen herring to the eagles, many people began to wander away. Jean threw fish to the eagles here on the Homer Spit nearly every day of the past 30 years. That is a dedication and tenacity that I deeply admire and respect. And despite the phalanx of photographers and those vying for a position of honor in Jean's fenced-in yard, I found it to be a special moment--a moment of reflection on people and nature, life and death, brevity and legacy. I was glad to be there to share this moment. Just as I was putting together the previous blog post, everything on my desk started hopping and shaking and there was a hollow noise like Denver pounding up the stairs. It took me a few seconds to realize that it was an earthquake, but by time I ran down the stairs the worst was over. Our houseplant leaves were still quivering madly, but the roar was gone and other things weren't shaking. The leaves continued to quiver for another 20-30 seconds before they finally stilled. This is only the second quake we've noticed since being here. The first one I barely noticed (was like the feeling of a heavy truck driving by outside), and it was a 5.0 with the epicenter in Homer. This one was substantially longer and stronger, so I'm guessing it was a 6.0. I'm heading in to the Islands and Oceans Visitor Center right now for a Family Fun Day, and they have a seismograph there so we'll go check it out! Later....Guess Islands and Oceans doesn't have a seismograph (maybe I saw one at the Pratt Museum?? ), but the lady at the desk had the following website up (http://www.aeic.alaska.edu/recent/sub/index.html) and kindly let us look it over. When you follow this link, you'll discover there have been dozens of quakes in the past few days, but this one was by far the largest (most were 1.0-3.0; this was 5.73). One of the ladies was at the Visitor's Center this morning during the quake and she was scared because the cables that were attached to the beams holding up the large glass wall were twanging, something she's never seen before. They were afraid it was all going to come down! In my house, one cup fell over in the cupboard and that's it. No damage to the Spit or anything. It was bigger than usual, but still pretty mild. Of course, at our house we were a good 70 miles from the epicenter (48 miles from Homer), and it was also 62 miles deep. WOW! Amazing that we could feel it at all! I've been reading up on the 'Quake of '64 so I am somewhat mentally pschyed for a big one, though I don't think anyone is ever truly ready for an event like that. What is normal a little puddle with grass pushing through 1/2 mile from our house became a nice-sized pond with our recent thaw and rain. I'd been eying it each time I drove by it the past week, but it wasn't until Denver and I were out walking yesterday and we discovered that the ice was very smooth that we decided to try it out skating. It was wonderful! The ice was nearly as smooth as what you get at a skating rink, it is protected by trees so we didn't have a wind, and no one else had been on it, so it was fresh, unmarked ice. Joy! The big pond by our house has water levels that vary quite a bit, and it is deep as well, so it is not as safe to go out on. As you can see from the picture to the right, that ice is all broken up now, and wasn't even frozen in places. So until it snows again, we have a new local skating pond! Yep, that's me ice skating on our driveway. Two days of rain has turned all side roads into, literally, skating rinks. When 100 mph winds and flooding closed the road past Ninilchik today and the school district forbade anyone from participating in school activities, Doug and the kids couldn't get to Anchorage for the robotics competition tomorrow. Doug had the ice skates in his vehicle, so the moment he pulled in, I got them out. I headed down our driveway (I'll admit, I slid down the first part of it on my backside; it's pretty steep) and then skated about a 1/4 mile to the neighbors house and back. With the headwind and uphill it was quite a workout. The warm weather is holding, but it has finally stopped raining. The ice won't last long at this rate. We had a glorious sunset and now the stars are out. This weather is just leaving our heads spinning! Personally, I prefer the cold to the wet & icy. Break from the Outdoors: Bay Club Time! I walked outside today and said, "Yuck! Rain!" Yes, believe it or not, that cold snap has suddenly turned warm and our snow is disappearing quickly with rain, rain, rain. Thus, rather than hit the ski trails today, I headed to the gym (Fancy that--subzero, I'm outside skiing, but rain? I head inside!). I peeked into the pool area and saw I had the whole pool to myself--joy! It redeemed this yucky-weather day. The Bay Club is our local gym. It is twice the price of our gym in Michigan, and maybe slightly nicer. We weren't sure it would be worth it, so just signed up for 6 months last year. When we arrived back home after a summer of traveling, we discovered we did indeed miss it, so in the gloom of fall, doled out a large amount of pocket change and joined again. This time around, it feels like we are using just about everything they've got! The climbing wall is the kids' favorite. Both Aurora and Denver look like they were born climbing, so I took the class, got my belay card (the person on the bottom who holds the ropes and keeps the climber from falling) and now the kids climb a couple times a week. They climb at the high school also, but that is a straight wall. The Bay Club's wall has ins and outs that one must climb around, so is more challenging. The swimming pool is another favorite. Every Sunday we go to church, get some lunch and then head to the gym. The kids swim and Douglas and I take turns swimming with them and working out. It is a fairly warm pool, so it is a fun one for playing in--you don't start shivering after 10 minutes! I personally love the racquetball court! At our gym in Michigan we had to pay $12 per person each time we played even though we were members ($24!!). Here it comes with the price of membership. Doug and I manage to play racquetball once a week, and we appreciate the awesome workout we get doing it! The kids come on in and play too, which is just a blast with the ball bouncing crazily off all the walls. Denver, especially, likes hitting the ball against the back wall so that it goes and hits the front wall. The gym has the usual plethora of weight equipment, treadmills, ellipticals, stairsteppers and rowing machines, all of which we use. 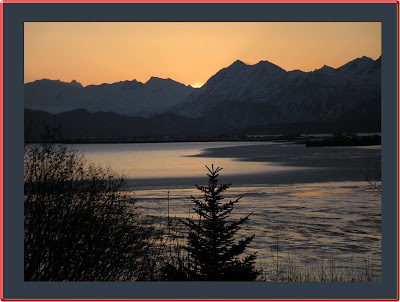 The best part of it is the view out the window, seen from any machine or the pool: the Homer Spit, Kachemak Bay, the Mud Flats and the Kenai Mountain Range, as seen in the picture above one morning a few weeks ago. It is so easy to count my blessings when I am rowing along, gazing out on such a glorious panorama with bald eagles cruising by regularly just outside the window. All the exercise classes are free, though we have yet to take advantage of any of them. Yoga, Pilates, spinning, tai chi, etc. They are well attended, and we can always tell when there's a class because the parking lot is full. The sauna and tanning booth are in regular use too, but we don't use those since we usually have the kids with us. The other big difference I've noticed about the Bay Club compared to our gym in Michigan is how people dress. In Michigan many females would be in scantily clad workout shirts or tight shorts. Here many women wear long pants and t-shirts while working out, and skimpy isn't something I've seen, so it doesn't feel like a pick-up place that I'm embarrassed to have my kids hang out. The locker rooms, on the other hand, see a lot more flesh than Michigan (I know, this is strange) and feels a heck of a lot more liberal than our gym back home. I'm not sure why this is. I keep expecting to get used to it, but the difference in dress and attitudes of patrons continues to strike me often. Overall, belonging to the Bay Club is a welcome place to spend some time when we're in town, and it is an important part of our lives. We still get out skiing, ice skating, and play basketball, but it is nice to have a place to take a shower and head to work after the workout--and it is a great place to have some family time too! Wow! It is above zero today! I am so excited, and amazed at how warm 10 above feels, after weeks of below zero weather. The main challenge for us with this cold snap has been having our bathroom pipes freeze each night. The sink is on an outside wall, and though the pipes are in the house, and the house is 65 degrees, if we don't keep the water running at least a trickle overnight, we have no water from the faucet come morning. A few minutes of hairdryer on pipes thaws them out, thank goodness. New Years Eve we went to church in Ninilchik and the heat had gone out, so we had a very quick 30 minute service, with our gloves on and hoods up. That day it was around zero, but we weren't dressed for the cold weather. The chill didn't leave me for hours, and I appreciated every bit of warmth in the house when we returned home. Amazingly, we have gotten out cross-country skiing nearly every day throughout this cold snap, which started a few days after Christmas. The kids get out too, but they're not good for playing outside for as long, and I keep an eye on them. When Denver starts getting white patches on his cheeks, I know we've been out a bit too long. I find that the cold is very tiring, and I am more worn out from the same amount of skiing. Skis just don't slide as well in cold weather, so I can walk right up steep hills on my skate skis, with no kick wax! Guess the added workout is a good thing--keeps me warm! We are blessed that both our cars started right up, even when parked outside in sub-zero weather. From what I've heard, AAA in Anchorage had 250-300 calls a day (compared to their normal 10), and car battery sales have been awesome recently. Firewood is precious, and one man in the bush is burning logs he had planned on using for a new cabin. The effect of being on the ocean is quite pronounced here, as you would see if you look at the weather map of Alaska. Homer is warmer than Ninilchik; while both are on the water, Homer has Kachemak Bay on one side and Cook Inlet on the other. Ninilchik just has Cook Inlet on one side. Just heading a few miles inland, such as in Kenai or Soldotna, means the temperatures are about 20 degrees colder than in Homer. So when our temperatures are at -10, we can guess Soldotna, 2 hours north, is at -30. This was the case Thursday when we drove to Soldotna. It was -4 when we left Homer at 8 am, and it was -26 in Soldotna at 10:00. Brrr! The one thing we are very thankful for is that with this cold it has been completely calm with not a breeze. A wind would have plunged the windchill beyond tolerable, but at least when it's calm it is bearable! The Kenai/Soldotna area always seems to have frost-covered trees, which are gloriously beautiful, as you can see from the photo above.